The G2KWorld Movement is all about Getting to Know the World! Let’s get together at a fun, inspiring, delicious, and authentic international restaurant and talk about our past travel adventures and future travel plans, meet people from different cultures and embrace the world. Invite your friends without passports also and be an inspiration to travel! Each month we will visit a different country via a restaurant in Miami. You will be transported to a paladar in Havana, Cuba without stepping on a ship or plane. 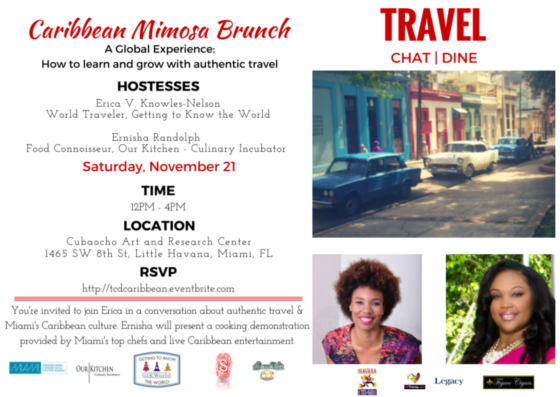 This event will be a Caribbean Brunch with flowing mimosas, live entertainment and is set in a fabulous art gallery. Our Kitchen – Culinary Incubator, who will be catering this event with a variety of Caribbean food and will feature Miami’s top chefs, whom will also provide cooking demonstrations.